In the Gulf of Mexico, approximately 70 miles west of Key West, are the seven saltwater reef islands that make up Dry Tortugas National Park. Juan Ponce de León, a Spanish conquistador and colonial administrator in the Caribbean, discovered and named the Dry Tortugas in 1513 as he sailed around the Florida peninsula. In the centuries that followed his first Florida expedition, the reef islands were an important navigational marker for sailors in the Gulf of Mexico and many ships passed through – and wrecked – in the Dry Tortugas. In the mid-19th century, when the islands were no longer a Spanish possession, the United States built Fort Jefferson, on the Dry Tortugas’ Garden Key Island to guard the Florida Straits. 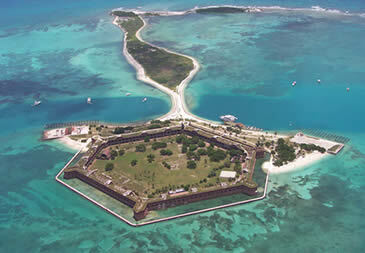 Spanish explorers discovered the Dry Tortugas in 1513 during the first official European expedition to Florida. The leader of the expedition was Ponce de León; after serving as governor of Puerto Rico, he acquired from Spain the right to explore unknown lands north of the island colonies. In the spring and summer months of 1513, Ponce de León sailed along the coast of Florida and throughout the Florida Keys. In June, he and his men stopped at the Dry Tortugas to hunt for sea turtles and seals to restock their food supply. Ponce de León called the islands “Las Tortugas” (The Turtles) after the large turtle population. British sailors later renamed them “Dry Tortugas” because the islands have no natural source of fresh water on them. “Tortugas” is one of the oldest European-named places in the United States. Juan Ponce de León’s 1513 expedition was also the first to document the Florida Current, which later became an important channel for ships traveling from the Gulf of Mexico to Europe. The Florida Current is a fast-moving ocean current that moves east out of the Gulf waters into the Atlantic Ocean, where it becomes the Gulf Stream. The Dry Tortugas are located on the northwest edge of the Florida Current and sailors looked for these reef islands to navigate through or around the current. Not all of the ships that passed through the Straits made it out. Hurricanes and shallow reef waters made the Florida Keys treacherous, and there are shipwrecks in the waters in and around Dry Tortugas National Park. 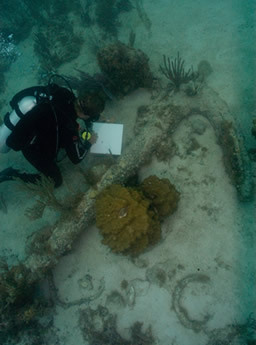 The first documented shipwreck in the area was the Nuestra Señora del Rosario, a 600-ton Spanish galleon that wrecked in 1622 at Loggerhead Key in the Dry Tortugas. The Nuestra Señora del Rosario was part of a large treasure convoy traveling from Havana, Cuba, to Spain and was one of nine ships in the convoy that went down in the Florida Keys when a hurricane hit. The Nuestra Señora del Rosario alone carried half a million pesos worth of silver, which the Spanish recovered after the wreck. Other ships, including British ships, that are known to have wrecked at the Dry Tortugas before the United States annexed Florida in 1821 are a Spanish relief ship (1691), the Granville Packett (1765), the Santísima Concepción (1775), the Maria (1806), and the Sir John Sherbroke (1816). Ownership of the islands transferred from Spain to the United States in 1821. After annexing Florida, the United States invested in lighthouses and a large fort on the Dry Tortugas. Americans built the first lighthouse on Garden Key in 1825 and the second on Loggerhead Key in 1858. By the time of the construction of the second lighthouse, the Army Engineers had started building Fort Jefferson to protect one of the most-strategic deepwater anchorages in North America, but never completed the on-going project between 1847 and 1875. Hurricanes, yellow fever, and a lack of funding and interest stalled the project permanently. Even so, Fort Jefferson was one of only three Union forts in the South that did not fall to the Confederacy during the Civil War, and the fort also served the United States as a prison and recoaling station during the 19th century. The fort’s most infamous prisoner was Dr. Samuel Mudd, who was convicted of participating in the conspiracy to assassinate President Abraham Lincoln and served nearly four years at Fort Jefferson before he was pardoned. In the latter decades of the 19th century, the US Navy used Fort Jefferson to recoal ships. The USS Maine left the harbor at Fort Jefferson in 1898 when it weighed anchor for Havana, Cuba, where its explosion led to the Spanish-American War. Fort Jefferson, its contributing buildings and structures, and the Garden Key Lighthouse are part of the Fort Jefferson site. In addition to preserving and protecting its cultural resources, Dry Tortugas National Park conserves the natural resources on the islands and in the reef. On the islands where Ponce de León’s men hunted turtles for food, sea turtle habitats are now protected. 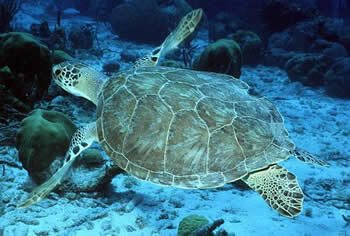 Endangered loggerhead, hawksbill, and green turtles nest on the Dry Tortugas. Certain parts of the park are restricted to non-invasive activity or closed to the public, but public areas are set aside for snorkeling, swimming, and camping. Visitors interested in the island’s history can visit Garden Key to tour Fort Jefferson, where there is a visitor center, and Loggerhead Key to visit its historic lighthouse. Dry Tortugas National Park, a unit of the National Park System, is located approximately 70 miles west of Key West, FL. Click here for the National Register of Historic Places file for Fort Jefferson: text and photos. The park opens year-round during daylight hours, except for Bush Key, which is closed from February to September. The visitor center opens daily from 8:00am to 5:00pm. Dry Tortugas can only be reached by ferry or seaplane out of Key West, or by private boat. For more information including transportation prices, schedules, and reservations, visit the National Park Service Dry Tortugas National Park website or call 305-242-7700. Fort Jefferson in Dry Tortugas National Park has been documented by the National Park Service’s Historic American Buildings Survey. Fort Jefferson, Dry Tortugas National Park is also featured in the National Park Service Along the Georgia-Florida Coast Travel Itinerary and in the National Park Service Places Reflecting America's Diverse Cultures: Explore their Stories in the National Park System Travel Itinerary. The Windjammer Site (Avanti) is included in the National Park Service Florida’s Shipwrecks: 300 Years of Maritime History Travel Itinerary.